I've been keeping busy the past couple of days as my friend is visiting. Last night we had a farewell night out for me, and we went to the pub with a few close friends. If you're ever in Belfast, check out 'The Duke of York' bar off Donegal Rd in the Cathedral Quarter of the city - a place full of character and atmosphere. We all had quite a lot to drink, which isn't my usual lifestyle at all, and today we are suffering just a little. Not to be deterred, we have headed up to the scenic North Coast of N Ireland for two days camping. 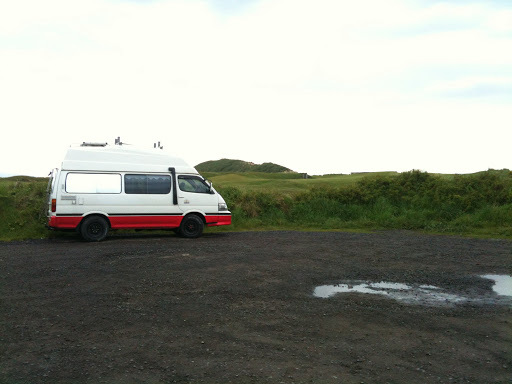 Tonight we're parked in a seaside car park with a beautiful view and its very relaxing and peaceful. Just what I need at this point. We're sharing this spot with a German reg. VW T5 - so there's a good feeling of safety in numbers, not that there's anything to worry about here. Earlier today I did a spot of fishing off Carrickfergus harbour, and within 10 minutes caught a small pollock using a shirasu head and Eco Gear bait. It was very similar in size to the ones I caught last weekend in Donegal so the young must be prevalent around this coastline at this time of year. In case you're wondering, part II of the wild camping trip video will be ready in a couple of days as its mostly edited and almost ready to upload. Here's a shot of tonight's camping spot..
What are your thoughts on wild v campsite camping? Any other camper van people out there into fishing? Leave a comment.